Is there any configuration which applies to all of your Players? Then don’t waste any more time and set it up in one click! You can also select to apply the settings to Player Groups, instead of all Players. In your OnSign TV account, click on your username on the bottom-left corner. Then, select “Settings” from the drop-down menu. Click the “Default Player Settings” from the sidebar menu. 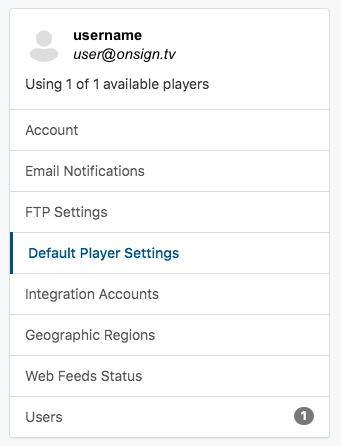 On the new page, you can configure settings, email notifications, set a logo for players with no content and set working hours for all Players at once. If you want to apply certain configurations to a great number of Players, but not all this function is useful as well. On the right of each setting, there is an "Apply" icon. Click on it. A new window will display an option for All Players and your Player Groups. Select as many groups as you want, then click “Apply”. Click “Save Settings” at the very bottom of the page before leaving.